CALHOUN, Ga. — Summer is fast approaching, and Morning Pointe of Calhoun associates knew just what to do to help their residents enjoy their favorite summer games indoors. 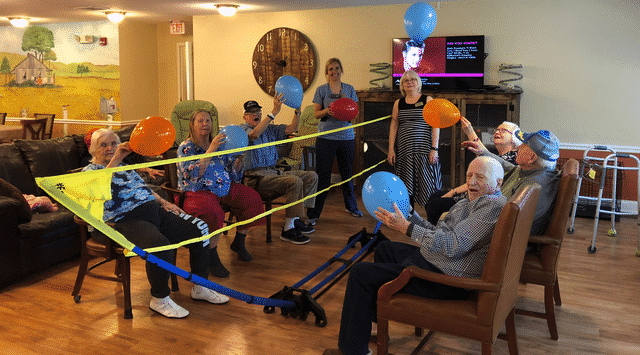 Balloon volleyball has quickly become a popular morning exercise at the assisted living and Alzheimer’s memory care community. Passing brightly colored balloons back and forth over the net were Morning Pointe residents who are keeping their motor skills in check. The seniors enjoy staying active as associates Rebecca Williams and Kerrie Egbert enforce only one rule — to have fun. Behind every Meaningful Day(tm) is a team of associates who help residents embrace healthy, active lifestyles one toss or spike at a time. To learn more about associates who are making their mark in the lives of seniors and their families, visit www.morningpointe.com/makeyourmark. Photo: Morning Pointe of Calhoun residents enjoy healthy morning exercise thanks to resident assistants Rebecca Williams and Kerrie Egbert. Click here to learn why families are choosing Morning Pointe of Calhoun!